Olli Jokinen is in his second season with the Winnipeg Jets, which is his seventh NHL team spanning 16 seasons; probably not the way the third overall pick (Los Angeles Kings) in the 1997 NHL Draft envisioned his career back then. 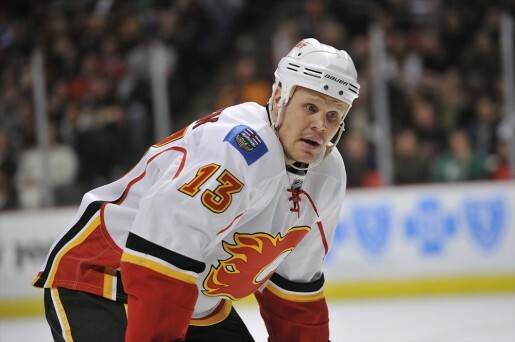 Having said that, he has had a productive career with 711 points (303g-408a) in 1,113 games, but because he languished with the Florida Panthers for so long he has only been in the NHL playoffs once — in 2008-09 with the Calgary Flames. The Panthers’ failures cannot be blamed on Jokinen though, in three consecutive seasons (2005-08) he put up totals of 89, 91 & 71 points. He played in 799 games (ten seasons) before playing in his first NHL playoff game, an NHL record at the time. This season with the Jets he has 14 points in 26 games, which matches his point total from last season over 45 games. The points don’t come as frequently for Jokinen anymore, but he is still in the league because he contributes in other areas: taking/winning face-offs, playing on both power play & penalty kill units and leadership on a team with twelve players 25-years-old or younger; Jokinen was a captain in Florida for five seasons and wears an ‘A’ with the Jets. 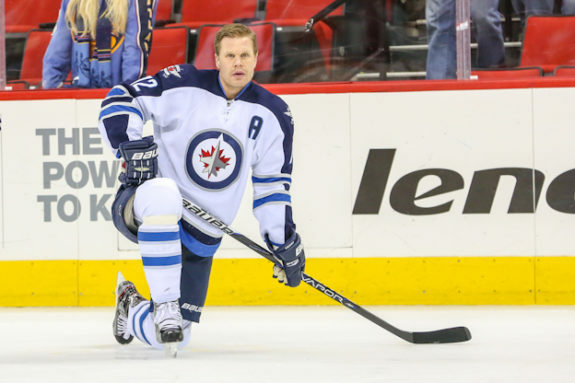 After a recent game in New Jersey the Hockey Writers caught up with the 34-year-old Jokinen to discuss what it’s like playing in a city like hockey-mad Winnipeg and some memories from his days with the Panthers and Flames. The Hockey Writers: Your team came into the game tonight winless in it’s last four, how important was this win? Olli Jokinen: I’m happy every time we win; this is a tough building to come into and play. We knew what they wanted to do, we were able to execute our plan against them and it’s a good way to start this six-game road trip. THW: What has the experience of playing in Winnipeg been like for you? OJ: It’s a great Canadian city, people love hockey and being in the Canadian market those fans always want to see you do well. We have a good ownership group, good management…it’s a good place to be. THW: Is it a city where you get noticed away from the rink more than in other places you played? OJ: I’m a normal guy, I have three kids at home; I live my life my way. It doesn’t matter what city I’m living in, I don’t change my lifestyle or what I do off the ice because people might stop me to say hi or ask for an autograph. Obviously in a small city people will recognize hockey players but its just part of being a player in a Canadian market. THW: You played eight seasons with the Florida Panthers, what are your memories from then? OJ: (pauses for five seconds) I had some really good years there, but obviously with the team we didn’t do that well. I was able to play with some great players there: Gary Roberts, Pavel Bure, Joe Nieuwendyk, Nathan Horton, Jozef Stumpel; they’re all still friends to me too. Like I said it was a tough time there because the team didn’t do that well but I had a chance to play with some Hall-of-Famers. THW: You’ve been on a few teams since leaving Florida, has it been tough bouncing around like that? OJ: No not really, I was in Calgary almost three and a half years and this is my second year in Winnipeg now. It’s part of the business, that’s the way it goes. I was in Florida for eight years; that’s a long time with one team. Obviously it’s never easy for family to move around and find a new place, but it is what it is. You can’t really control these things.